Cushioned, speakers AND a fan, all in one. Logitech has announced its Speaker Lapdesk N700, the company's first all in one laptop accessory with integrated stereo speakers, fan and padded base. Laptop trays have become increasingly important as more and more homes get laptops, and Logitech has now produced one that not only brings built in speakers but a cooling fan as well. Priced at £69.99, the Lapdesk N700 will be available throughout Europe in March. "More and more people around the world are enjoying fantastic entertainment on their laptops — but with mediocre sound and comfort," said Denis Pavillard, Logitech Vice President of product marketing for laptop accessories. "In fact, according to our research nearly 50 per cent of laptop users report being dissatisfied with the sound quality of the built-in speakers. 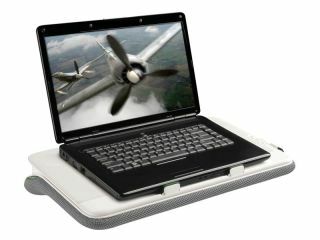 "The Logitech Speaker Lapdesk N700 helps transform your laptop into a private cinema in the cosy confines of your lap."